ST. PETERSBURGA gas canister blew up inside Russian Delta III class strategic nuclear submarine moored in Russias Far East Kamchatcka region last Sunday, killing one sailor who apparently managed to prevent a far greater catastrophe, Navy officials and Russian mass media reported on Friday and Saturday. Bellona was informed of a possible submarine accident on Kamchatka as early as November 15, but official sources denied anything untoward had occurred. Russian media, likewise, remained silent on the topic until the Friday, when the NTV Russian television network reported from the funeral of Dmitry Koval, the 19-year-old seaman killed in the explosion. “I was told that there was an explosion, a gas explosion, and Dima was hit by the shockwave,” his mother, Tatyana Koval, said of her son in remarks broadcast on NTV from Kovals hometown of Krasnoyarsk in Central Siberia. Two other crew members, who remain unidentified by naval officials and the Russian media, were injured in the blast, according to NTV. Russian naval officials confirmed the accident happened as early as November 14th, and was supposedly the result of a burst pipeline pumping oxygen into the vessel during maintenance work. This version spread quickly through Russias mostly state-owned media. But other experts, including Bellonas Alexander Nikitin and other naval experts have called that explanation into question, saying the explosion most likely occurred in a higher pressure hose used for cooling the torpedo compartment that was attached to the submarine at the time of the accident. NTV also reported this version of events. The seriousness of the accident would suggest that it occurred in the gas-pressure chambers that fire torpedoes, which, if not contained by Koval, could have led to far worse consequences. The Russian Navys press officer, Captain First Rank Sergei Dygalo, told Bellona Web in a telephone interview Saturday that the explosion had occurred during routine maintenance as the result of a malfunctioning air pipeline passing air into the submarine. He confirmed the accident had happened on Sunday, November 14th at the Vilyuchink navy base in Kamchatcka. Yet another source from within the Navys Headquarters, who would identify himself as only as an admiral, told the Interfax news agency on Saturday that the accident had resulted from the explosion of a pipe pumping air into the subs fresh water tanks to maintain pressure there. According to the admiral, these were the official results of a special committees inquiry into the accident, which have been delivered to the Russian Navys Headquarters. The Ministry of Defence, when reached by telephone, acknowledged the incident, but likewise would not be more specific about how it had occurred. They said they were aware of the committees findings. Nikitin, a former Captain First Class and reactor engineer on Russian submarines, based his scepticism that a simple oxygen pump had exploded based on calculations of the air pressure that is pumped through such hoses0.4 kilograms per square centimetre. Nikitin said that, most likely, the accident occurred in a pipe using higher pressureup to 400 kilograms per square centimetre. This pressure would more likely correspond to coolant pipes used in the torpedo section, said Captain Second Class Andrei Berezin of the Russian navys Pacific Fleet. “He saved the lives of the crew of the submarine. The circumstances of his death should be explained by the press service of the Pacific Fleet said Berezin. The Pacific Fleet has yet to do so and calls to their public affairs office went unanswered Saturday. The submarine affected was the Pacific Fleets K-223, project number 667BDR, also known as “Murena.” It has been in operation since 1980. Equipped to carry as many as 16 intercontinental nuclear missiles, Delta IIIs are considered to be the backbone of Russias current ballistic nuclear missile fleet. It remains unclear whether any missiles were on board during last Sundays accident. Over the past four years, Russia has not had a good track record with submarine accidents. 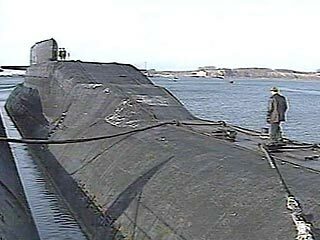 In 2000, the nuclear submarine Kursk sank and all 118 crew died. Nine sailors died when another nuclear submarine, the K-159, sank in stormy Arctic seas in summer 2003 while being towed to a dismantlement point near Murmansk. In each case, Russian authorities were sluggish to report on the incidents as they developed and gave contradictory statements to the press. Igor Kudrik and Charles Digges reported from Oslo. Rashid Alimov contributed to this report from St. Petersburg.